Apparently bringing classic movies back to theaters has become a great new focus over at AMC Theatres. They've already brought back films like Back to the Future and Airplane!, and yet another spectacular film from decades past is headed back to theaters for two nights only. 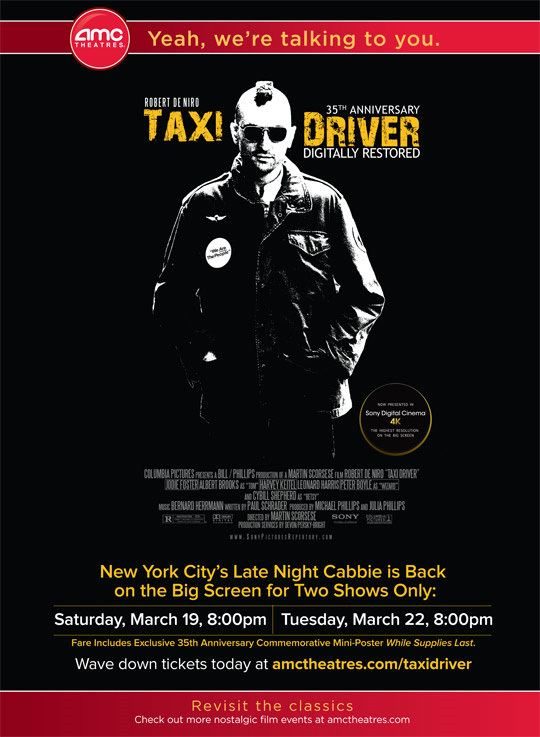 The theater chain just announced that Martin Scorsese's Taxi Driver will screened for the film's 35th Anniversary later this month. If you've never seen the film, the story follows troubled taxi driver Travis Bickle (Robert De Niro) as he attempts to clean up the scum of the streets, starting by saving a young Jodie Foster as a teenage prostitute. The film will only be in theaters for two nights only on Saturday, March 19th at 8pm and Tuesday, March 22nd at 8pm (times are local). The screening will be presented in Sony 4K Digital, so it won't be as glorious as a real print of the film, but it will still look damn good. In addition, attendees will receive a commemorative 35th anniversary poster (likely the one pictured above). You can check out the full list of theaters by heading over to AMC Theatres official event page for the anniversary screening right here. Once again, I can't reiterate enough how you must see Taxi Driver if it's somehow escaped your radar. Will you see Taxi Driver in theaters? You talkin to me? You talking to me? You talkin to me??? Classic. saw this in the theater 10 years ago for the 25th anniversary and of course, seen it a billion times on dvd and tv..thank god its not in 3d...yet. My favorite movie of all time. Tickets purchased! http://www.youtube.com/watch?v=0k_ZBz30BJA Listen to the dialogue from 53 seconds to 1 minute and 6 seconds. That dialogue/voice over was never put into the film. Its the first time I've ever heard it. Taking my buddy who has never seen it and I havent seen it in a while, pretty freakin stoked.